There are many photographers here on WP whose work I’m privileged to see daily, and one of my very favorites is Kathy at Backyard Bird Nerd. 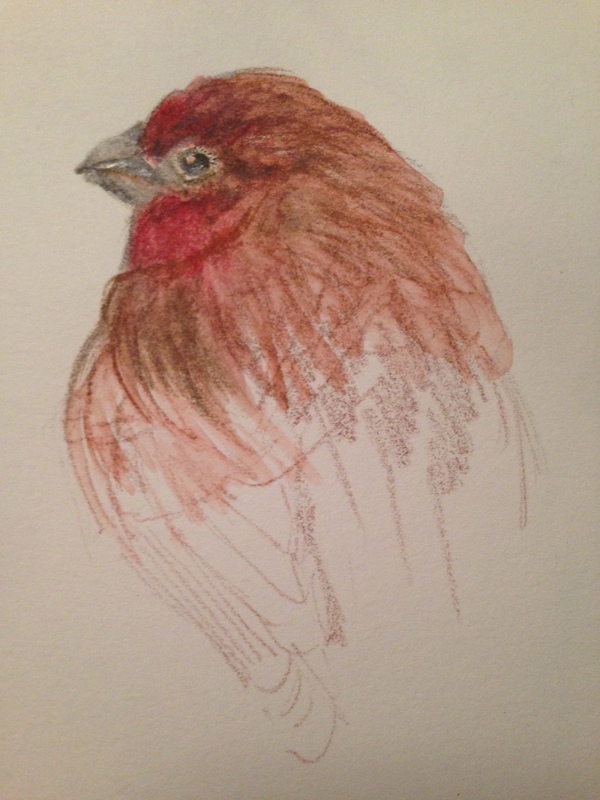 Her recent post of three stunning bird closeups had me itching to grab a sketchbook. I want to thank Kathy for her friendship and encouragement, and for helping me and many of the other artists here out with reference photos for Draw a Bird Day every month! So I’ll be featuring several of her photos this week. I also want to thank my friends Kerfe and Nina at Method Two Madness for hosting January’s edition of Draw A Bird Day. If you’d like your artwork to be included in the compilation this month, post a link to your work here. We like to celebrate our winged friends on the eighth of every month! Happy Monday, and just think…..the days are getting longer every time the sun rises and sets. Spring will be sprung before we know it! Peace and plumage to all. Oh Laura! It took me a moment to lift my jaw up off the floor and begin breathing again after I saw this one!!!! Holy Schmoly is it stunning! Oh Laura – really – the growth is phenomenal – you are soon going to have to give up the day job and be a full time artist! Truly Extraordinary! Wow I like that Laura. Thank you so much, Jane! It feels good, I feel I’ve finally found a focus for my work in faces and it’s like I wanna shoot off into space! So glad you enjoy it! Jane, to be honest, that’s what I’m hoping for! So thank you very kindly! I have noticed that it is getting light earlier in the morning. I really like the way you made the jaw on this bird. Me too, and later at night too! It’s good to see when it’s pretty cold out. I’m glad you enjoyed this one! I thought I had overworked the beak a bit, so I’m really glad you liked that part! Hi Laura, I like how you focused on the birds head and then indicated the body with some quick lines. Beautiful drawing today! Thank you Sharon! I hope you are flying high today, my friend! I also like the focus on the bird’s head and your return to color! Are you sure the days are getting longer…it is still dark outside! We finally came out of the clouds yesterday afternoon! :)) Glad you enjoyed this, Carmel! …. it is a beautifully rendered picture–just lovely–and thank you for pointing me to her website! Thank you, Lance! And you’re most welcome! I have a feeling you will love what you find there. Everything you draw is delightful…just like you are! I’m guessing it’s a house finch? I’ve not been to Kathy’s blog yet but will! You’re so sweet, Teresa! You got it, a house finch. The photo was a joy to work with! Thanks for your kind encouragement, friend! You have superbly captured a moment of reflection on this little face Laura, is it where is the food? or I will have a nap? lol Probably so, Denis! 😀 I am just loving this face challenge! It is so much fun. Glad you enjoyed this! You’re very welcome, Denis! Birds are so special and the more photos, the better! Nice to be able to connect you both! Beautiful work, as usual, Laura! Thanks again for the link! Only a few more months, too, to April 8th (the annual event). Thank you again for leading us to this! We all enjoy the celebrations so much! I’m so glad you think so, Margaret! Thanks for dropping by! Glad to find your blog, and to start following you. Your drawings are great…and I like the ‘uncolored’ cardinal better! Beautiful finch! I love the richness of the colors :-). And yay! The days are getting a little bit longer every day!